なりた、はねだ、かんくう（かんさい くうこう）names of airports, －など such as, etc. In this context, Shujin / Go-shujin refers to "master, shopkeeper (of a family business owner)"
even if he is a single (unmarried). When "master, shopkeeper" is a woman, it should be Okusan "wife". Watashi wa Tokyo ni sumimasu means "I will live in Tokyo (in the future)". "I live in Tokyo (now)" must be Watashi wa Tokyo ni sunde imasu. －して shortened form of shite kudasai "Please do"
[person A] wa [something] ni chuui suru "[person A] is careful of/about [something]"
[person A] wa [person B] o chuui suru "[person A] warns [person B]"
A. 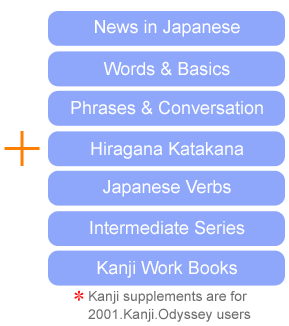 Choose the appropriate Kanji of the word in the box.